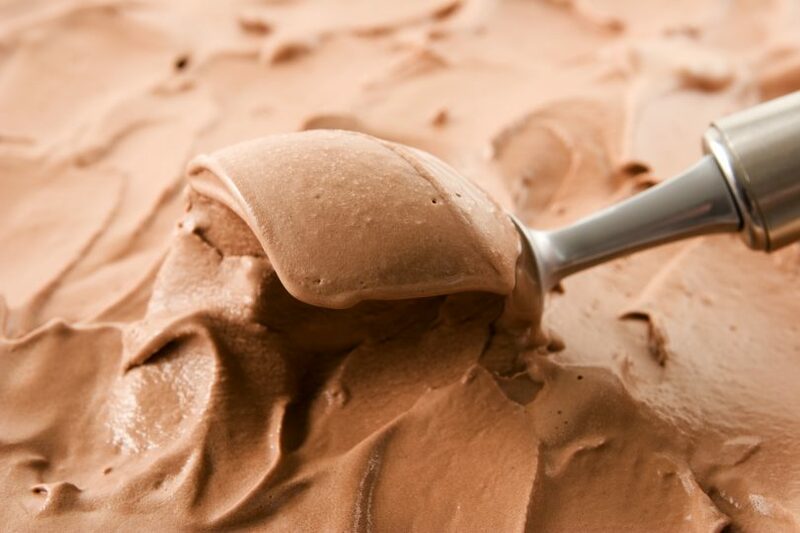 #1 – All ice cream is made from milk (or cream) and milk contains protein, so therefore all ice cream contains protein. #2 – The type of milk (or cream) used to make the ice cream will dictate the fat content, and therefore dictate the calorie content. Although milkfat may vary, protein remains the same by volume. #3 – Some brands will add additional whey protein to their products so that they can market it as a high-protein choice. Check out the ingredient list for this and any extra additives. But really—how much protein do we need? Although eating a product that promises protein in a good-to-eat package sounds great, protein is one nutrient we, as Americans, are likely not deficient in. Almost everyone is getting an adequate amount of protein on a daily basis. Of course, athletes— or those who exercise regularly and weight train—will have somewhat higher needs. The Recommended Dietary Allowance, or RDA, for protein is 0.8 grams per kilogram of body weight. So for the average man weighing 195 pounds (88.4 kg), he’d need about 70 grams of protein a day. But guess what? That amount equals 2.4 ounces—only a little larger than a standard tennis ball. The problem is that any extra protein we eat and don’t use gets filtered out through our urine. So overconsumption of protein equals overworking the kidneys. Over time, that could lead to kidney damage. There are numerous other foods that provide excellent daily sources of protein, such as animal products like beef, poultry, pork, eggs and dairy. Plant foods like whole grains, beans, legumes, nuts and vegetables also contribute to our dietary protein intake, and tend to be much healthier choices. Any whole food that’s low in saturated fat and refined sugars but high in vitamins, minerals and antioxidants are great choices. High-protein, low-calorie ice creams can potentially satisfy your sweet-tooth craving without all the added calories, fats, and sugars in traditional ice creams or other desserts. Many of these low-calorie ice creams are sweetened with sugar alcohols. It’s worthwhile to note, however, that although they don’t impact blood sugar levels or contribute to calorie counts, they can have some gastrointestinal-related side effects for some people if consumed in high quantities. Although some say these options can fill you up more than other ice creams—so you end up eating less—here’s where reading the ingredient list makes even more sense. Typically, it’s fat that, in any food, gives us that sense of satiety or fullness. But food companies will add fillers, particularly to lower-fat ice cream, to try and elicit a similar reaction from the consumer. Examples can include cellulose, carrageenan, soy and even air. So read the ingredient list. What is in it that makes it low-calorie/high-protein? Can you pronounce all of the ingredients? Just how many ingredients are in it? Generally speaking the fewer ingredients the better, when it comes to any food. Another potential pitfall is that because these ice creams are marketed as “healthier,” you might end up eating a lot more dessert than you planned for. For example, a pint of one of these products might have the same calories as a half-cup of “regular” ice cream. So think of it as a balance between your personal position on processed foods such as high-protein ice creams and your ability to control your portion size. In some instances, these low-calorie ice cream treats may be satisfactory to help ward off sweet cravings with fewer calories or allow you to let yourself “over-indulge” without all the guilt. But sometimes you may just want to eat the real stuff, in proper portions, and that’s OK too. We know that eating healthy can be hard. To learn about our nutritionists and specialists, including weight-loss services, call us at 706-446-4887, or visit augustahealth.org/weightloss.